As a mom of three beautiful daughters; Abby 12 years, Hailee 9 years and our recent precious addition, Bella who is now 6 months old I have traveled through the years of baby gadgets! When Abby was a new baby 12 years ago this past May there was one type of swing, well two but they both only swung one way and you had your choice of wind up or battery operated. When Hailee was born almost three years after Abby there were cooler swings, ones that swung front-to-back and side-to-side. These swings had more comfy seating, globes with multiple musical choices and mobiles. When I found out that we were expecting Bella I had been out of the loop on baby gear for almost 9 years – scary! 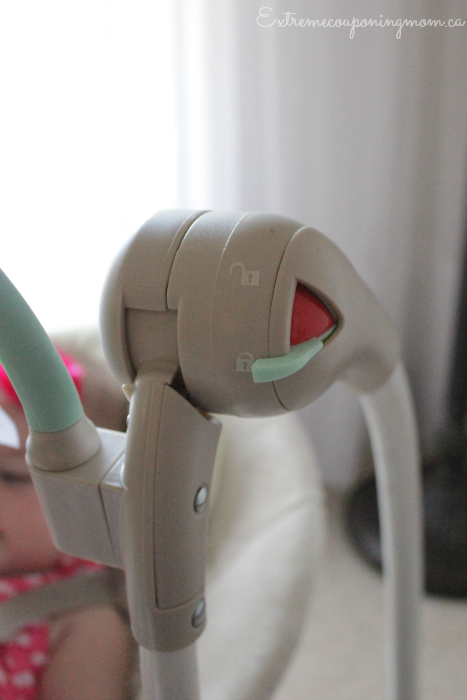 There were so many new gadgets, things that were not around when my girls were little ones. Of course my first thought when thinking of what swing we would have for our new bundle I went with the big cradle swing that has a mobile, music and swings multiple ways. This was what I knew from my last baby, Hailee. Of course the big swing is great if you a) have a lot of room and b) will never leave your house, I have a lot of room as our home is very spacious and well truth be told I rarely leave home other than to grocery shop or the very rare occasion/party we’ve been invited to. When I was given the opportunity to review the ConvertMe Swing-2-Seat by Ingenuity in their Seneca design I was excited, I had been looking for a smaller swing that could possibly be a great addition in our home for when I am working in my office and don’t want to lug Bella’s big swing to my office or when we travel to visit family & friends who in the world wants to lug a huge swing with them and invade someone else’s home like that lol! I love how compact this swing is in comparison to our full-size swing, it is literally the size of a bouncer chair <– something else that was never around with my other two girls lol! Ingenuity ConvertMe Swing-2-Seat is two amazing seats in one! This swing converts easily to a seat with soothing vibrations thanks to the Easylock function. My other absolute favourite part has to be their SlimFold design, this means when we are off to visit friends it folds flat for easy storage and transport in our van. This swing comes with 5 swing speeds along with 8 beautiful melodies and 3 nature sounds. The volume has 3 levels which I also like as I can lower the sound for when she is drifting off or turn it up if she is playing. Another amazing feature is the timer, you can set it to turn off after 30, 45 or 60 minutes to help conserve batteries. Ingenuity also wanted to help parents save batteries by powering the swing with Hybridrive Technology which will make your batteries last 3x longer. I have to say I have been using this swing for over a month now and have not had to change my batteries as of yet! The swing also has WhisperQuiet technology which makes for silent operation, other than the music of course! LOL what a face Bella, she is totally into squishing her face up and breathing funny right now! I love this part of the swing a lot, I can’t count how many times I have almost whacked Bella’s head trying to get her out of her other swing. 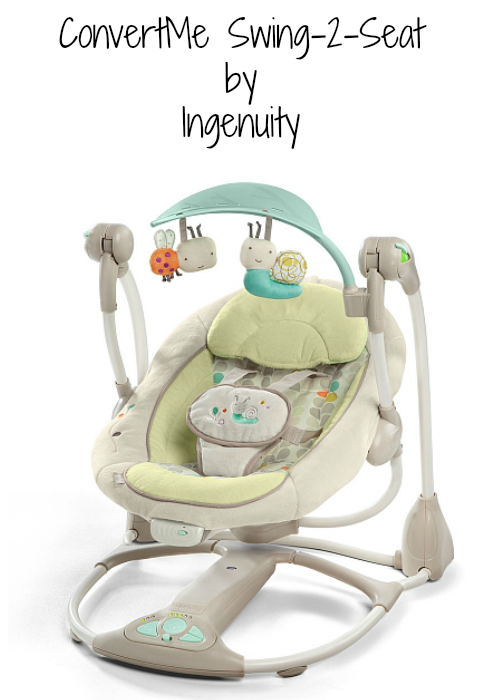 The ConvertMe Swing-2-Seat has a great toy bar with two cute bug toys as well as space for you to add up to 3 more should you choose. 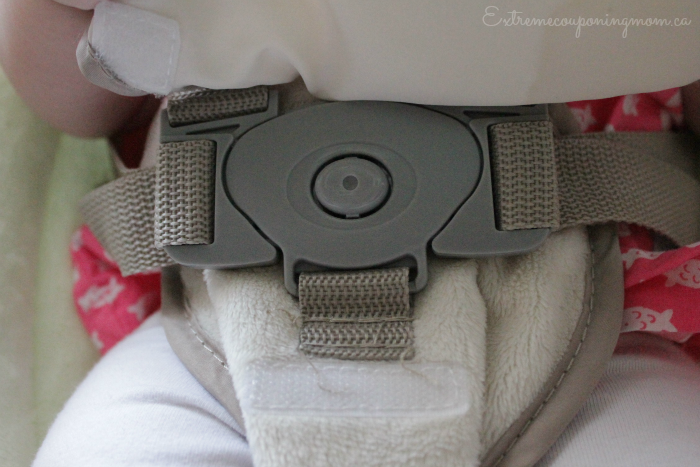 It also PIVOTS out of the way to give you full access to put baby in or get baby out with ease (and no bumps lol). 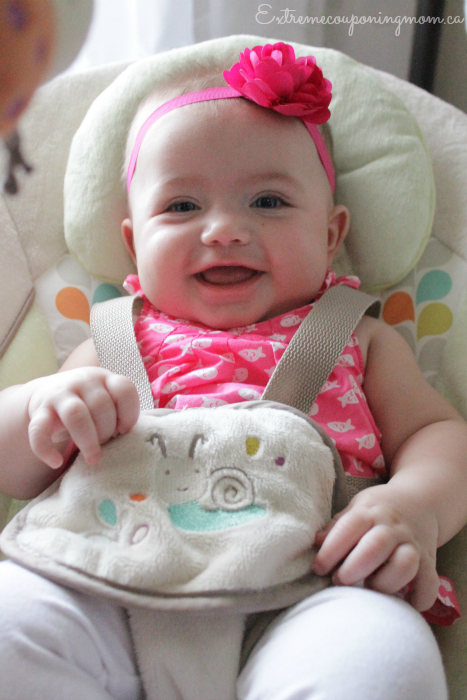 Another great feature is the 5-point harness which helps to keep baby nice and protected while enjoying the swing! 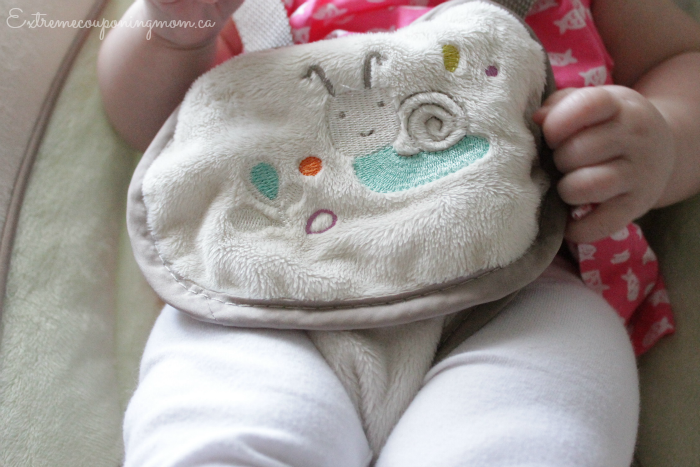 The buttons are hidden behind a uber cute cover that attaches with Velcro. Both the seat pad and head support are machine-washable. 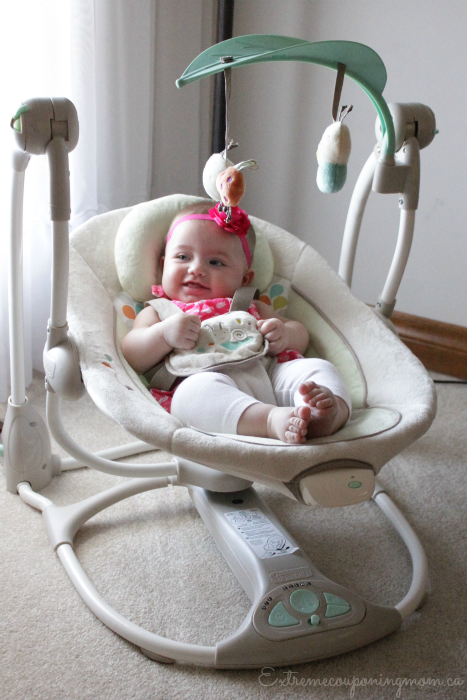 The ConvertMe Swing-2-Seat is recommended for babies from birth up to 20lbs. Both Bella and I fully recommend the ConvertMe Swing-2-Seat to any new or expecting parents, it is a great compact product! She just loves sitting on the porch or in mommy’s office in her new swing/seat! I have to be honest the day I decided to do our photo shoot for the review Bella was in quite the funny mood. It was right before her feeding (what was I thinking right!) 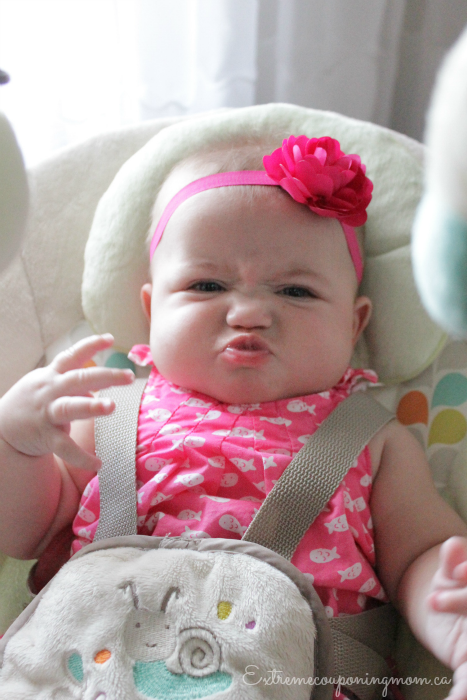 and well let’s just say as much as she loves her swing she was either making this face or crying. It took a lot of effort to get her to cooperate that morning and I now know to do our product review photo shoots AFTER feeding time! Honestly though how cute is that face? 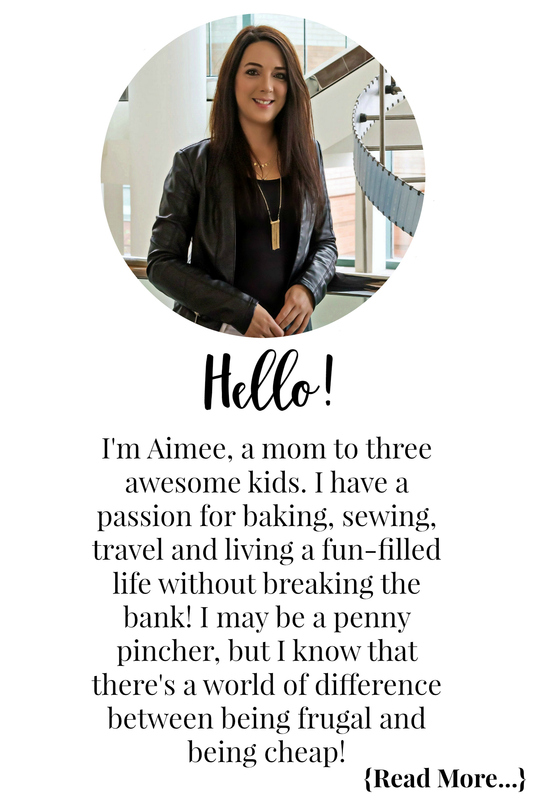 You can find Ingenuity on their Website, Facebook, Pinterest and Twitter! Disclosure: Ingenuity provided me with the above mentioned product in order for me to complete this review. Even though I was given a product for this review I always give my honest opinions, findings, beliefs, or experiences. The views and opinions expressed in this post are purely my own based on my research and experiences. Any product claim, statistic, quote or other representation about a product or service should be verified with the manufacturer, company, provider or party in question. Your daughter is so adorable… I love that it is convertible and does not take lots of space.. 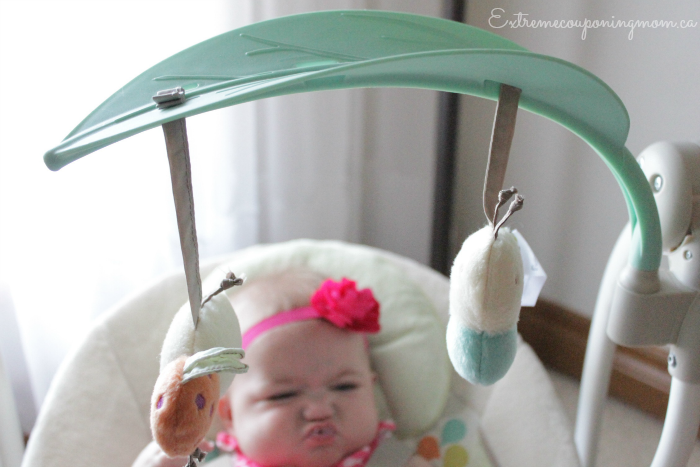 I had a swing that turned into a infant seat, and then a toddler rocker, and I loved it! I am all for things that are multiple purposes! Wow! Baby gear really has improved! When my daughter was a baby, we couldn’t have survived without a swing through dinner times. But the swing we had was a huge, clunky thing! This swing is amazing. Swings sure have come a long way since my boy was born…..they think of absolutely everything these days!